The security of the supply chain is becoming one of the most important aspects on the agenda of many organizations. This may be due to regulatory impositions, as is the case of financial institutions, on the part of both the European Central Bank (ECB) and the European Banking Authority (EBA), or also due to a growing awareness of the impact that the supply chain has on the business itself. And this awareness has a lot to do with the application of the European General Data Protection Regulation, which explicitly obliges the controllers to ensure that the third parties to whom they subcontract the processing of the data in their possession comply with the security measures that the responsibles should demand them. This post is only available in Spanish. This entry is only available in Spanish. We have heard some news in these first months of 2018 related to the National Security Scheme (ENS), mandatory compliance framework in terms of IT security in Public Administration field. In February, LEET Security was accredited as certification entity in accordance with the ENS, and in April the approval resolutions of two new Technical Security Instructions were published in the Official Government Bulletin; whose objective is to properly develop the implementation of requirements and measures included in the ENS (Royal Decree 3/2010). On the one hand, the resolution of March 27, 2018 approves the Technical Security Instruction for Information Systems Security Audit (BOE-A-2018-4573). And secondly, the resolution of April 13, 2018 approves the Technical Security Instruction for Security Incidents Notification (BOE-A-2018-5370). 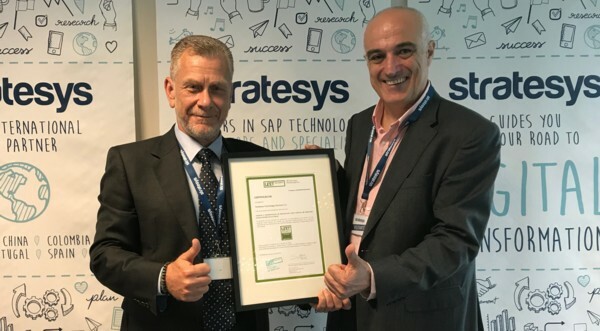 Spanish digital services multinational Stratesys has obtained the Cybersecurity rating from LEET Security, which credits its effectiveness and quality in the development, support and maintenance of applications on the virtual environment of its clients. This certification shows the effective application by the consulting company of a high control framework and security measures in the three evaluated dimensions: confidentiality, integrity and availability. The rating recognizes not only Stratesys' operations in terms of security management but also endorses the level of robustness and rigor of the security measures with which it provides remote services for support and maintenance of applications. This notice in only available in Spanish. We are sorry. This entry is not available in English. 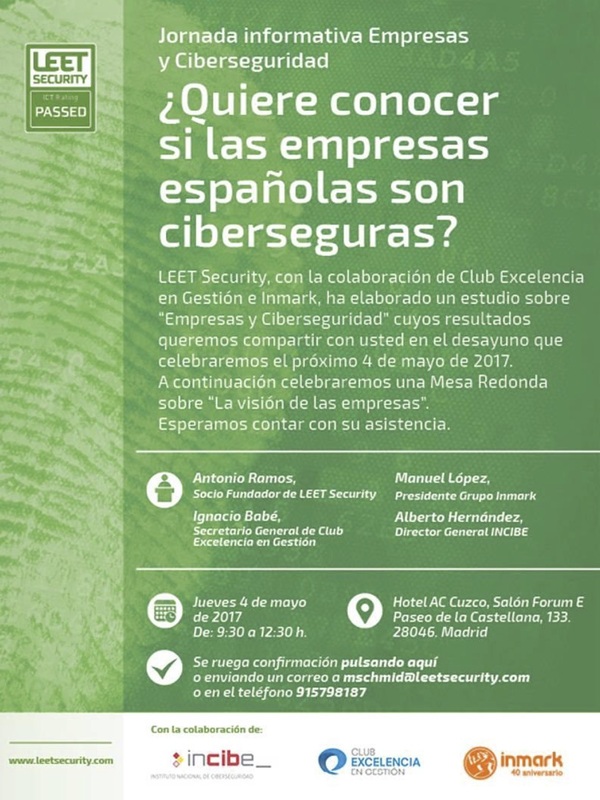 Last April, 27, LEET Security participate in the Club de la Excelencia en Gestión section at program Pulso Empresarial with Antonio Ramos, together with Miquel Romero i Grané, Members and Knowledge Director to present the resutls of the Study 'Corporations and Cybersecurity'. During the interview, we review the more relevant results of this Study, together with a short and clear explanation of key points of security rating: what is security rating? What elements are assessed? What is the meaning of rating?... And, also, some reflections on the impact of new privacy regullation (GDPR), cybersecurity accountability in corporations or, even, how rating could be incorporated into corporate compliance. Interview can be hear in the followink ling from minute 30 ahead (in Spanish): link to the podcast and the CEG review of the interview at this link. In this webinar organized by Valencia Chapter of ISACA, we share the paper given by Antonio Ramos in CSX2016 Europe event organized by ISACA in London, past October. As stated in the title, we will address the options an organization has to know, to understand and to manage the cyber risk of relationships with third parties, both providers and partners, connected and non-connected services and, of course, taking into account the organization risk appetite. Last May, 14 and related to the recent incident on Friday known as WannaCry, Founder Partner of LEET Security, Antonio Ramos, has been interviewed for the News, both in La 1 and Telecinco channels. ¡¡Sorry, this content is only in Spanish!! Free access. You can downlowd the full program and register here. After Snowden, some days ago media published a new case. Again, a Booz Allen Hamilton employe has been charged of secrets theft. It is not clear yet, if he has passed this documents, if he is a spy o if, simply, he was storing that information. The New York Times, "N.S.A. Contractor Arrested in Possilbe New Thef of Secrets"
Schneier on Security, "NSA Contractor arrested for Stealing Classified Information"
HelpNetSecurity, "Why attaching security to each piece of data is critical"
Forbes, "After Snowden, Another Booz Allen Contractor Accused of Stealing NSA Files"
SecurityAffairs, "Once again an NSA contractor is the headlines for the alleged theft of secret exploit codes and highly confidential documents"
The paper presented by LEET Security to Iberoamerican Congress of ICT Governance and Advanced Management (gigaTIC16), "(Security) Vendor Risk Management: You cannot live without it", has been selected by the organizing committee of ISACA Barcelona and itSMF España at Catalonia. Therefore, next April, 28th at Telefónica Difital 00 Auditorium in Barcelona, we will have the opportunity to share how security rating can be used in vendor risk mamagement processes. Sorry. Not available in English. 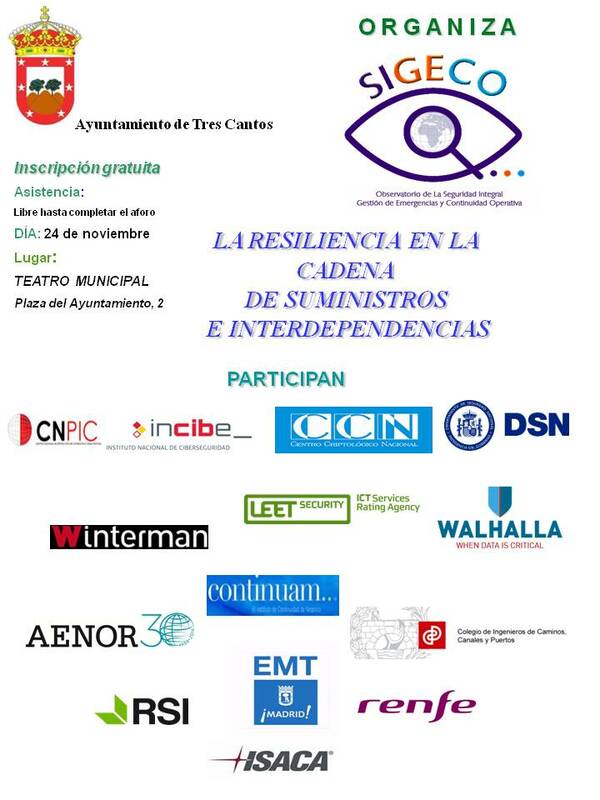 LEET Security participates in the AUREN event: "Security in the ICT Supply Chain"
Sorry! The information about this event is only in Spanish. In each session throughout the day, panels of experts in cloud computing will touch on their own experience to convey their perspective of these issues. Participants will be invited to actively discuss their own experience of these issues and together prioritise mechanisms to address them. On December 30, 2015, Aiuken Solutions achieved the rating seal of its services under the assessment and labeling methodology by LEET Security. Aiuken has addressed the rating of services provided from its managed security center (SOC), consisting of "Managed Security Services" (which include data protection services, IT systems operation and threat management), “Web Application Firewall (WAF) services” and the "Anti-DDoS services", obtaining in all of them the triple C C C rating, which demonstrates the effective implementation of a large framework of control and security measures in all three evaluated dimensions (CIA: confidentiality, integrity and availability). INCIBE, entity under Ministry of Industry, Energy and Tourism, and LEET Security, have signed a collaboration agreement to jointly develop a cybersecurity capability building model for industrial systems and applicable to strategic and critical infrastructures. This model will be based on the methodology developed by LEET Security to build up a labelling system that rates the efectiveness and maturity of security measures implemented by providers in their ICT services, and that will be adapted and evolutioned together with INCIBE to keep the allignment with international standards and good practices like NIST, ISA, ENISA, etc., as well as the own LEET Security model, creating a rating system based on 5 levels, from E to A.
LEET Security has acceded to the Collaboration Agreement "Smart City" of Móstoles City Council with the project " Reliable and Cybersecure Smart City" that seeks to assure that technological services that support smart city projects started in the town are trustworthy. 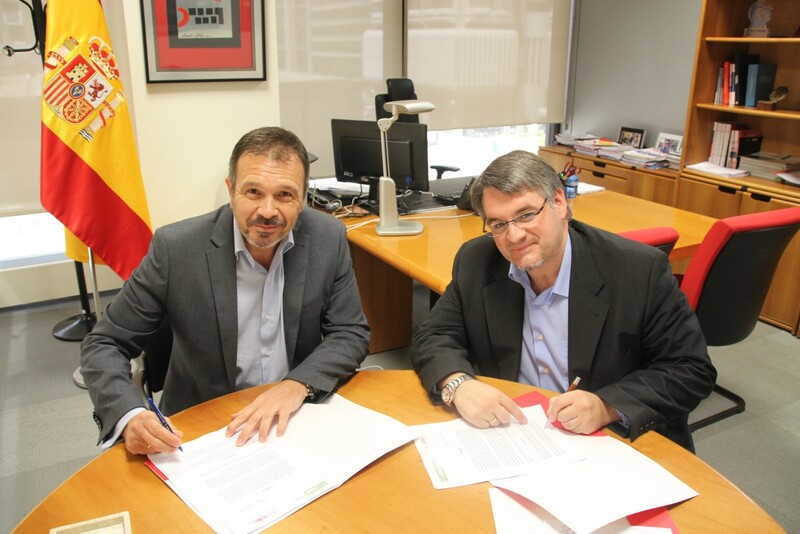 This project will develop, firstly, a pilot phase with ICT services users related with Mostoles City Council and associated entities to evaluate and identify the cybersecurity requirements that should be added to those ICT services in order to provide confidence and privacy conditions to the information managed. Rural Servicios Informáticos (RSI), entity that provides core banking services to Rural Groupo and other financial entities, has become first organization in rate the security of services provided gaining a B B A label according to LEET Security rating system. RSI has become the first organization in gaining the rating security label offered by LEET Security. RSI has undergone the rating of its 3 main services offered ('Services to Members', 'Services to Third Parties' and 'Internal Services') obtaining in all of them the level B B A. This rating level shows the effective application of a high control framework and security measures in the three dimensiones rated (confidenciality, integrity and availability). INCIBE publishes LEET SECURITY labeling in its section "Make Trustworthy Business"
INCIBE (Instituo Nacional de Ciberseguridad) has just published leet security rating mechanism in its website section "Make Trustworthy Business". This publication entails an analysis process by INCIBE abouth mechanism characteristics that ends with the publication of a summary of the main system characteristics in the website (link). As general summary, as stated in the information published by INCIBE, "this labeling / kite mark implies a rating of the provider being reviewed [the one that provides the service rated]. Therefore is quite important to check the rating of the label. This rating, refering to three dimensions of security, rates from A to E. In this scale, A means a higher security and maturity than E."
Interview [in Spanish] to our CEO, Antonio Ramos, in Group of Research of Bioinformatic, Intelligent Systems, Educational Technology Department of University of Salamanca. European Union Agency for Network and Information Security has just published the list of existing cloud certification schemes that includes the first security labelling system developed by LEET SECURITY over its rating system. European Union Agency for Network and Information Security (ENISA), supporting the activities of the EU Cloud Strategy, has published a list of the existing Cloud Certification schemes (CCSL – Cloud Computing Certification Schemes List). This initiative will help potencial cloud users decide on the security of different cloud solutions. The list was developed by ENISA in close collaboration with the European Commission and the private sector (EC Certification Selected Industry Group). Evicertia understands the importance of provide transparency to the security they implement in their services and, for that reason, it has relied on leet security rating system to label the security of all its services. eVicertia (Evidencias Certificadas, SL), in his continuous efforts in security, understands that transparency is essential to build up trust with its users and, for that reason, it has decided to become the first company in adopt the rating system proposed by leet security, rating agency. Thanks to this agreement, eVicertia and leet security will work together to verify the applicability of rating guide in all the services of certified notification provided by eVicertia (eviNotice, eviMail, eviSign y eviSMS) and the use of this security labeling system in these services. Antonio Ramos, CEO of security rating agency will present the session "Rating cloud services security" inside the Conference VISION12 organized by itSMF Spain the following 19th and 20th of November in Madrid. Antonio Ramos, CEO of security rating agency and author of blog Carpe Diem will be at 6th Edition of ENISE - Encuentro Internacional de SEguridad de la Información (Information Security International Meeting) that INTECO organizes annually at León (Spain). Specifically, Antonio Ramos will participate in the session "Security bloggers meeting 2012" that will takes place on 23th between 18:30 and 20:30. EuroCloud España, consciente de las garantías demandadas por los usuarios acerca de la seguridad y confidencialidad de los datos almacenados en la Nube, ha firmado un acuerdo de colaboración con la agencia de calificación de servicios TIC, Leet Security, para facilitar el acceso de sus asociados a este sistema de generación de confianza. La calificación ofrecida por Leet Security sobre los asociados de EuroCloud España contará con el respaldo de la organización de cloud computing y estará disponible para su consulta. De esta manera, aquellos interesados en contratar soluciones de cloud computing podrán comparar antes de contratar un servicio la confidencialidad, integridad y disponibilidad ofrecida por distintos los proveedores y elegir entre ellas según sus propias necesidades. Vídeo de la Agencia de Noticias europapress (enlace). itSMF España junto a la Universidad Carlos III de Madrid, la Universidad de Oviedo y la Universidad de Extremadura organizan el próximo 28 de mayo, el Academic ITGSM12: VII Congreso Académico Internacional en Gobierno y Gestión del Servicio de las Tecnologías de la Información (TI). Who's Responsible For Security In Cloud Services?